The rare revenue warnings from Apple suggested weaker-than-anticipated sales of iPhones and other gadgetry, in part because of trade frictions between Washington and Beijing. Apple shares slid some 7.6 percent in after-hours trade on the news. 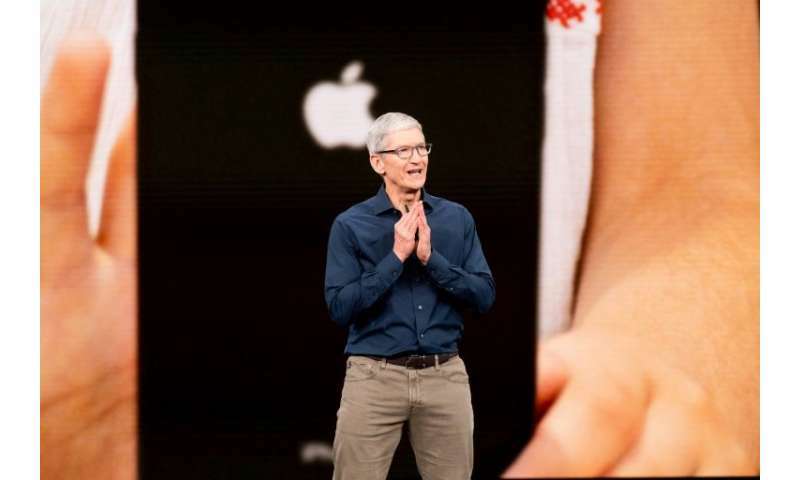 "While we anticipated some challenges in key emerging markets, we did not foresee the magnitude of the economic deceleration, particularly in Greater China," Apple chief executive Tim Cook said in a letter to investors. Apple is the target of nationalist sentiment over the arrest of Huawei's chief financial officer in Canada at the behest of the United States on alleged Iran sanctions violations. Meng Wanzhou was detained in Canada on December 1 on a US extradition request linked to sanctions-breaking business dealings with Iran. The Chinese government has condemned the arrest and demanded her release. Some Chinese netizens and companies have also turned against Apple. Several companies have offered employees subsidies for Huawei phone purchases, while others have even warned staff against buying Apple products. 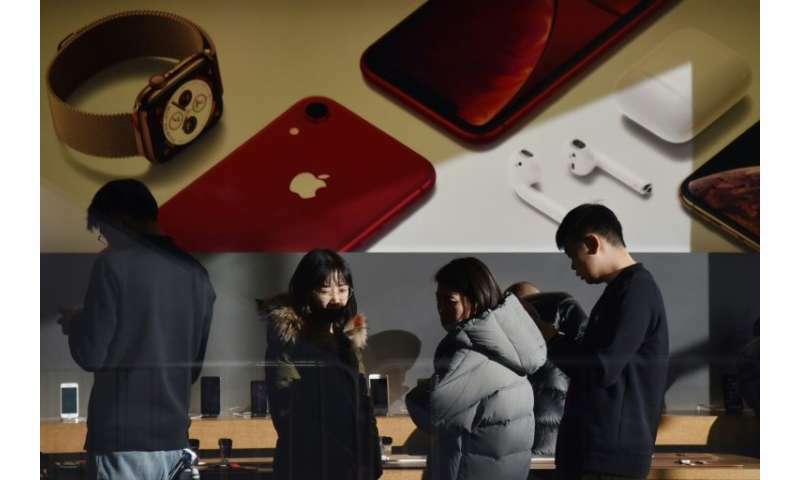 "When the US went after the Huawei founder's daughter, the Chinese government made Apple the target of the day, so sales should be way off," independent technology analyst Rob Enderle told AFP. "This is more political than it is Apple execution." Nationalistic sentiment was likely intensified by Apple apparently ignoring a Chinese court-ordered ban on iPhone sales in a case involving US chipmaker Qualcomm, according to the analyst. Qualcomm, which requested the ban, said last month that the Fuzhou Intermediate People's Court ordered four Apple subsidiaries to stop selling older models of the iPhone, including the 7, 7 Plus, 8, and 8 Plus. But Apple stores contacted by AFP in Beijing, Shanghai and Fuzhou in early December said they were still selling those older models—confirming a company statement that all remain available. "It looks like Apple is flouting Chinese law, which helps promote a boycott," Endlerle said. Apple breaks down its revenues into a "Greater China" that includes the People's Republic of China as well as Taiwan. Cook said other factors will also pull down Apple's revenue, including the timing of its iPhone launches last year and a strong dollar that means lower revenues when converted to US currency. Apple also cited supply "constraints" for some products, including its latest Apple Watch and iPad Pro. "While Greater China and other emerging markets accounted for the vast majority of the year-over-year iPhone revenue decline, in some developed markets, iPhone upgrades also were not as strong as we thought they would be," the statement said. "While macroeconomic challenges in some markets were a key contributor to this trend, we believe there are other factors broadly impacting our iPhone performance, including consumers adapting to a world with fewer carrier subsidies, US dollar strength-related price increases and some customers taking advantage of significantly reduced pricing for iPhone battery replacements." Apple has been seeking to diversify its revenue stream in the face of a largely saturated global smartphone market, with new products and services. Cook said there were some bright spots for Apple in some parts of the world and that the company expects "all-time revenue records in several developed countries, including the United States, Canada, Germany, Italy, Spain, the Netherlands and (South) Korea." He added that Apple was performing well in a few emerging markets and could see record revenues in Malaysia, Mexico, Poland and Vietnam.